Split at the Root: A Memoir of Love and Lost Identity, chronicles Catana Tully’s incredible journey from a remote village in Guatemala to her success as a fashion model and university professor. 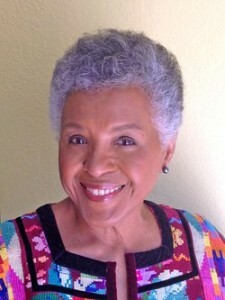 At the heart of the book is her fraught relationship with adoption—specifically her German adoptive mother, and the secrets and lies held within the circumstances of how she came to have white parents who lovingly called her their “little Moor.” I’m so pleased to have Catana on the blog today talking about identity, ethnicity, and adoption! Welcome, Catana! Laura: I love the way you let the story unfold for the reader—who is just as in the dark as you are as a child growing up in an affluent German expatriate family. They do truly love you, but dress you like a little doll and have expectation that you will be their perfect child. You state in many places throughout the memoir how as a child, you were fearful of anyone with dark skin, that you hardly acknowledged your roots, and preferred to identify with the “powerful” Germans. I feel as if “identifying as the ethnicity of one’s adoptors” is a common theme among transracial adoptees. Yet this phenomenon is hardly acknowledged or understood by adoptive parents. Can you talk a little more about this, and how you eventually came to embrace your true identity? 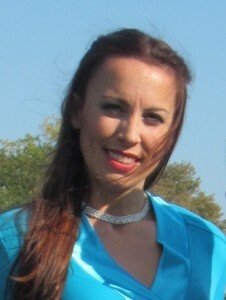 Catana: Thank you for this interview, Laura. Your question addresses exactly why I wrote Split at the Root in the first place. It concerned me that it was becoming popular to adopt “exotic” children. I know the term rankles some feathers, but from the perspective of the child that has been removed from its own race and culture to grow up as something precious because different and interesting, the term applies. As such a Black or brown or Asian child has the fact that it is different first and foremost on its mind… all the time. All the time. One young adoptee from India told me how much she hated it when her mother dropped her off at the kindergarten. There was always a big fuss when she arrived, basically a big fuss for/from the mother. “After she left, I was like the rest of the children. Because I was being dropped off by a woman who did not resemble me, I was the oddity.” Obviously, “exotic” adoptees see themselves as the adoptive parent’s conversation pieces. And they are not wrong because they become exceedingly conscious of being observed more carefully and creating concerns than a child of the parent’s race would not. Hair: how does one deal with this curly/natty hair? Skin: what can one do about the child’s perennially dry skin? Puberty may start sooner than with a white girl… it implies huge worries. My German mother thought I might have breast cancer when I started to develop breasts at age 9. I have heard of some Black girls that have started sooner. When so much attention is placed on your physical appearance, you just want to be like everyone else. Therefore, adoptees growing up in a society and parents of their own race are not as conscious of being different, and the parents conceal many a truth about them for a much longer time. The society in which I grew up had, still has what can be compared to a caste system. I realized that my very dark skin tone placed me in the lowest caste. I was darker than the servants. Thus, I made sure that my behavior and appearance was always immaculate. Everyone who met me saw me as an example that Nurture was stronger than Nature. After meeting my Black relatives several decades later, I realized that Nature had in fact won out. I was more similar to them than my German family. It was a HUGE struggle to embrace my Blackness. At times I still find am conflicted about it. I believe that I understand being Black along intellectual/emotional lines. I understand the racial/social injustice and empathize with those rebelling. More from a human empathetic perspective, as I have never lived in a Black community. I very much enjoy the company and conversations I’ve had with Black colleagues. And the man in my life since the death of my husband is East African. I empathize with White parents who have adopted children from a culture where they ignore what is in the child’s DNA, for even with some sense of knowledge and understanding, they face significant hurdles. Laura: I was also amazed by the therapist who you initially worked with. Given all of the horror stories that so many adoptees have with therapists who deny adoption loss, who view an adoptee’s adoptedness as unimportant or irrelevant … I admit I was somewhat surprised to see that your therapist encouraged, and even at times challenged you to face your past. Can you discuss what this experience was like for you? Why did you go to therapy in the first place—was it specifically for post-adoption issues? When she encouraged you to look critically at your adoption, you resisted … how did you finally accept that she had a point? Catana: The success my therapist has with her clients is that she is not an adoptions therapist. She specializes in Early Childhood Trauma. She actually never addressed anything that had to do with how I grew up. It was I who broached the subject every time. She knew from the very start that the issue underlying the inner conflict came from the separation from Rosa, my birth mother. But she never went there. She actually listened a lot and looked at me squirm through the sessions. It was impossible at first to find any fault with what I considered my stellar upbringing. Indeed, that upbringing has served me well throughout my life… No complaints. The problem came when I had to interact with Black people. I had always felt superior to everyone around me, and those around me were White. Again this was a class thing and I identified with the upper class. But I was quite incapable in relating to Black people who had mannerisms and used language I did not understand. It was a sort of mental paralysis that confused and rattled my framework. Why could I not interact with these people when I had lived in many different societies without a problem? I did not fear other races, why then the panic when among Blacks? With my therapist’s guidance I unearthed the issues… I unearthed them. The conversations I left in the book, like “Call her by her name,” came about after a few years of therapy, when she did push the envelope a bit. I think that because she was patient, I have been able to embrace the various parts of me slowly. Those who also “pushed the envelope” a bit and helped the process were my husband who was the most aware of my inner conflict, my son, and a very dear, close friend. In a way they all helped my therapist. Now have a wonderful relationship with myself, and both my families. Laura: You plan to write an article for the forthcoming Adoption Therapy, Volume 2 about coming to a place of wisdom and acceptance—about both your first and adoptive families. Can you talk a little more about what words of wisdom you have for those of us adoptees who are in our twenties, thirties and forties … raising our children, pursuing our careers … while still processing how adoption affected—and continues to affect our lives? Catana: Of course, every adoption experience is different. But there are patterns that I have found, repeat. One of the blessings one has as an older person is having the time to reflect on obstacles and lessons learned through the years. After the publication of Split at the Root, many people have contacted me regarding issues embedded in the story. It appears that I have found a new purpose in my life: being of service to others, supporting them as they navigate the tricky waters of not having known the birth mother, and the ever recurring issues of abandonment. It does not matter who the mother was, but at one point she was all we knew… and we lost her. In natural healing practices, Abandonment is the single-most cause of physical and emotional ailments. Adopted or not, everyone has multiple times in life when they experienced abandonment… It is important to find these and honor them. Thank you sooooo much, Catana! 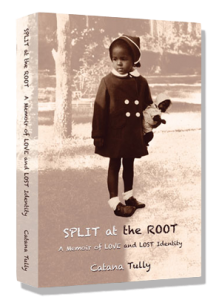 Be sure to purchase Catana’s amazing memoir, Split at the Root. Despite a lifetime of outward accomplishments, it took years of therapy to understand where my sudden crippling insecurities came from. I’ve succeeded in incorporating the many dimensions defining my personality and character, and I’ve transformed inwardly and outwardly into a confident woman with a solid sense of self. Whether they were in the adoption sphere or not, people who read Split at the Root began contacting me, and I began to interact with them regarding a multitude of issues. I became a safe sounding board. With that realization, I decided to become a Life Coach specializing in supporting interracial adoptees (and others who are mixed race) and their parents, in facing their demons, and sketching out where they wanted their relationship with themselves to be. As a Life Coach, I look specifically at the future: which differs significantly from therapy work. My knowledge of astrology, a serious study I began half a century ago, is an excellent tool for discerning where each client is at that particular stage of life and an additional tool available to me in my guidance. So, to be sure I in no way judge my clients, my sessions are conducted over the phone or Skype. By not seeing their physical appearance or their reactions, I don’t allow anything to come between being able to listen deeply and guide gently. Thanks a really great thanks for it. Thanks for this gift idea and this page is really very beneficent for music lovers or for the people who want to get information about music for writing essay or for different purpose. That musician in the video up there is looking very interesting and I am impressed to see him with this nice talent. This post is so wonderful, as the ideas shared in it are extremely useful. This is an awesome post, i become a regular read of your blog thanks for sharing. The adoption of a child of different nationality can be difficult both for the adults and for the kid, but any relationships can be improved if filled with love. Amazing blog thanks for sharing. Yea i saw you blog too it's amazing. 70-410 practice test software to double your results. Up to date Microsoft 70-410 PDF questions for MCSE, MCSA, MCSM, MCSA 2012, MCP, MCSA Windows Server 2012, MCSE Server Infrastructure. It was really very beautiful book to read that you have been talking about in this article. I really like to say that it was really good to go through this article to know about this book. Simple one touch game play with lots of levels that will keep you entertained for hours! Jump and fly your way through danger in this rhythm-based action platformer! It was an amazing post. We will be inclined to location unit the agency providing you the most effective services regarding inside a short amount. In USA you will realize U.S. Everyplace, every city and 24/7. Really great information you have shared. We the company founded in 1977 and started franchising since 1992, United Check Cashing and landed as a check casher industry in USA. We are covering most of the cities and still giving you the best services within very short period with top notch http://www.unitedcheckcashing.com satisfaction. We can trace us 24/7 and you are always welcome. Wow!What an amazing and useful article,delivering a very nice and peaceful messege.Hope that My australianwritings assignment services would copy it.Good blog. Bear in mind to additionally discuss with this website Equals training advisory board we would have were given a one-way link purchase and promote agreement in our midst. That musician in the video up there is searching very interesting and I am impressed to look at him with this excellent expertise. MLB World Series 2018 Live Stream , The 2018 Major League Baseball season began on March 29, 2018. The regular season . Regulating internal conflict may in like manner show up as MyCourseworkHelp.co.uk the client’s internal trade through their words and exercises. Completed with yielding and caution, a gifted coordinator can empower a client to see that their exercises in reference to money have been driven by inside solicitations, feelings, and judgments.